BROOKLYN is a big fat chocolate eclair of a film. It's a little obvious and predictable and it goes down a treat but it's not filling at all. In a sense, it's just a very polished version of one of those big fat doorstop historical romance - a romantic drama from Barbara Taylor Bradford or an afternoon TV costume drama. It's been cast and dressed above its station but really, that's all it is. 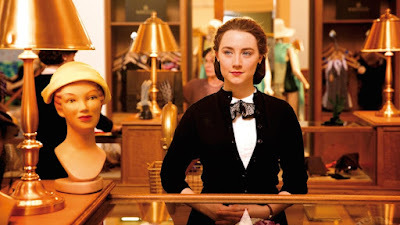 Saoirse Ronan (HANNA) plays a young Irish girl called Eilis who leaves a small 1950s Irish town with few opportunities for a new life in Brooklyn. She rooms with an hilarious lady played by Julie Walters with a host of giggling housemates, and with the help of a kind priest (Jim Broadbent) soon finds her feet. She also finds love in the shape of a sweet Italian plumber called Tony (Emory Cohen - THE PLACE BEYOND THE PINES). The problem is that on her first trip home, Eilis is greeted by a quite different set of opportunities and yet the same small time gossip. The question is whether she will remain or return to her new life armed with this new perspective. Director John Crowley (BOY A) creates a fast-paced and no-nonsense movie with lovely period furnishings and a great cast. But there's nothing remotely surprising about the film and not having read Colm Toibin's source novel I'm not sure whether that's down to him or the screenwriter Nick Hornby. The foreshadowing is heavy indeed and when certain events happen in the final fifteen minutes - well, it's obvious. It also became quite weary for me seeing Saoirse Ronan crying every fifteen minutes or so. Maybe if I'd seen this film in a normal week I would have liked it more. But when seen in the context of a film festival, in between films showing such real and searing emotion, it all just felt rather Hallmark card-like. If it gets award nominations, as some are suggesting, this says more about our love of nostalgia and the Old Country than the inherent quality of the film. BROOKLYN has a running time of 105 minutes. It is rated PG-13. The movie played Sundance, Toronto and London 2015 and will be released in the USA on November 4th, in the UK and Ireland on November 6th, and in Singapore on February 18th, in Germany on February 25th and in the Netherlands on March 17th.